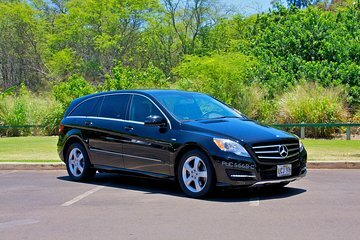 Enjoy a hassle-free arrival on Maui with this private transfer service by luxury sedan, SUV or limo. Meet your professional driver at Maui International Airport (OGG) and relax on the journey to your hotel in Kihei, Wailea, Makena, Lahaina, Kaanapali, Honokowai, Kahana, Napili or Kapalua. Prebook this one-way transfer and skip the stress of finding a taxi or shuttle. Private vehicles can accommodate up to eight passengers in your private party. You MUST select a hotel that coincides with the area in the itinerary section of this product. Failure to do so will result in a cancelled booking. The driver was there when we arrived and all went well. Had same driver on return trip who turned up right and time and was still had a good trip back to air port..
We went straight to the shuttle desk on arrival and the lady was expecting us. She took us outside to where the driver had the car ready and took us immediately to our hotel, which took about 45 minutes. We had decided to take a private transfer because, coming from Spain via London and LA, we had been up for 24 hours, and I did not want to hire a car (with all the associated paperwork) and drive somewhere I did not know, in the dark. A very good decision, and if you have come a long way, well worth the expense.